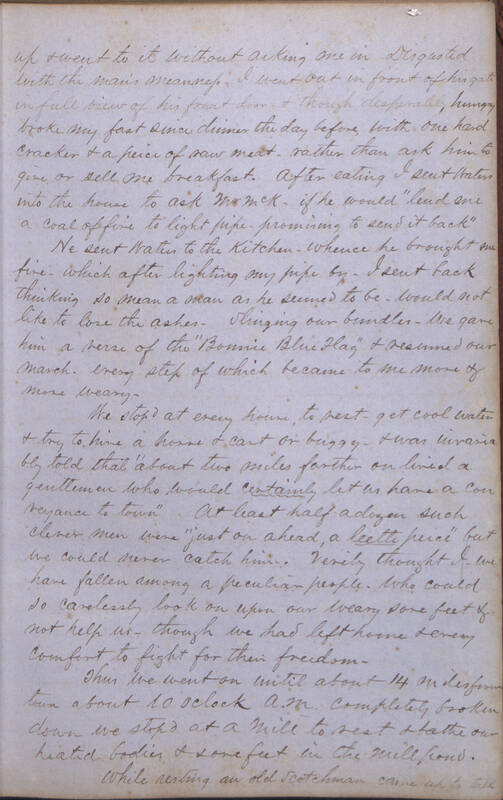 Item description: Entry, 4 August 1863, from the diary of Captain Lewis H. Webb, Company D, 12th Virginia Artillery Battalion. Item citation: From the diary of L.H. Webb, Lewis Henry Webb Papers, #1767, Southern Historical Collection, The Wilson Library, University of North Carolina at Chapel Hill. I cannot describe in such a manner as I wish our trip from Barclay’s to this place. 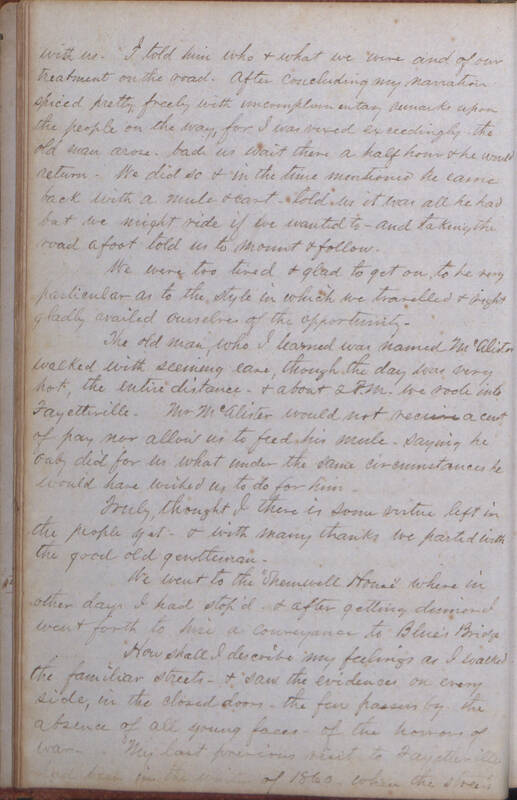 From Barclay’s we walked about five miles, when completely overcome with fatigue & heat I could travel no farther & and stopped about 12 o’clock at the house of a Mr. Truelove, where we got dinner and I induced him to take us in his wagon to Averysboro – seven miles. Arrived at Averysboro about 5 o’clock p.m. & then started to walk again inquiring at every house to see if I could hire a conveyance to Fayetteville but without success. I had a carpet bag with a change of clothes, a heavy sabre and pistol besides my overcoat to carry, and after walking until 8 p.m. I was completely “used up” & we laid down under a tree near the road & went to sleep. Nor did I wake till daylight when I found we were just in front of a fine house, where doubtless we might have got a good bed and a good supper. He sent Walter to the kitchens, whence he brought me fire – which after lighting my pipe by – I sent back thinking so mean a man as he seemed to be would not like to lose the ashes. Singing? our bundles we gave him a verse of “Bonnie Blue Hag” and measured our march, every step of which became to me more and more weary. We stopped at every house, to rest, get cool water, and try to hire a horse and cart as was invariably told “about two miles farther lived a gentlemen who would certainly let us have a conveyance to town.” At least half a dozen “clever” men were just ahead a little piece, but it seems we could never catch him. Verily thought I, we have fallen among a peculiar people, who could so carelessly look on upon our weary, sore feet and not help us – though we had left home and every comfort to fight for their freedom. Thus we went on until about 14 until about 14 miles from town about 10 o’clock am completely broken down we stopped at a mill to rest and bathe our heated bodies and sore feet in the mill pond. While resting, an old Scotchman came up to talk with us. I told him of who and what we were and our treatment on the road. After concluding my narration, spiced pretty freely with uncomplimentary remarks about the people we met on the way, for I was vexed exceedingly the old man arose bade us wait there a half hour and he would return. We did so and in the time mentioned he came back with a mule and cart told us it was all he had but we might ride if we wanted to and taking the road afoot told us to mount and follow. We were too tired and glad to get on to care much about the style in which we traveled and right gladly availed ourselves at the opportunity. The old man, whom I learned was named McAlister, walked with seeming ease, though the day was very hot, the entire distance, and about 2 pm we rode into Fayetteville. Mr. McAlister would not receive a cent of pay nor allow us to feed his mule, saying he only did for us under the same circumstances what he wished us to do for him. Surely, thought I, there is some virtue left in the people yet – and with many thanks we parted with the good old gentleman. We went to the “Shemwell? House” where in other days I had stopped and after getting dinner I went forth to hire a conveyance to Blue’s Bridge. 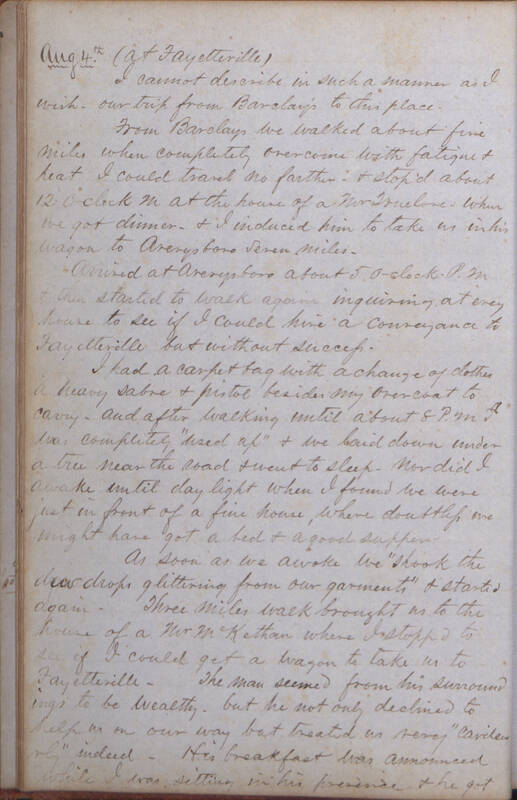 This entry was posted in Southern Historical Collection and tagged 12th Virginia Artillery Battalion, Averasboro, civilians, diaries, Fayetteville, Lewis Webb. Bookmark the permalink.